This journal is great for the writer or list maker in your life. It is outfitted with a refillable notepad so it can be used again and again. And they'll never be without a pen either! This piece is stitched by hand from up-cycled leather, so it is great for the tree hugger too! Made in Lexington, KY. Hint: Make this gift extra special by adding a hand-turned wooden pen!! 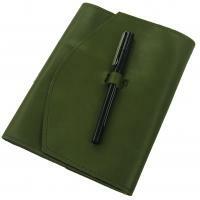 Hint: this journal and variations on the size can be customized for your needs with names, logos or images. Additional design fee applies and is based on the specific design. Please email or call us for details. size: 6" x 4" x .5"